In December 1533, a new cycle of preaching on Matthew began in the Wittenberg Castle Church. Luther himself inaugurated the series with three sermons on Matthew 1. Then the preaching on Matthew was assigned to the Wittenberg doctoral student Hieronymus Weller (1499–1572). Behind Weller’s sermons, however, stood Luther, who prepared notes to help his student preach. The notes touched both on the interpretation of the scriptural passages and on homiletical strategies for preaching them. Since Luther never offered a series of lectures on the Gospels, the Annotations on Matthew have tremendous importance as his fullest systematic scholarly engagement with a Synoptic text. 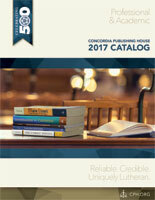 Volumes 67 and 68 of Luther’s Works provide translations of Luther’s most substantial continuous engagement with St. Matthew’s Gospel or indeed with any of the Synoptics. In the newest volume of the expansion of the American edition of Luther’s Works (volume 67), pastors and scholars will encounter for the first time in English Luther’s Annotations on Matthew, from which the following excerpt is taken. [Read more…] about More Luther Coming Soon!